MOMS, JUMIA WANTS TO HOST YOU #JumiaMothersDay! 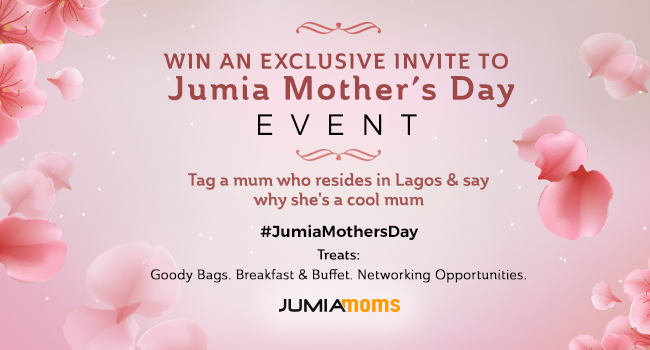 This year, Jumia will be celebrating the joys of motherhood as part of her Mother's Day event. The Jumia Mother's Day Look-Alike contest. Check it out on Jumia Moms Facebook Page HERE Jumia will host 20 Moms and these Mommies will have a great time on Thursday 23rd, March 2017. There will be exciting speakers on healthy living, child care & more. Lots of goody bags & exciting giveaways await. SISIWEEKLY EP #85 "OUR FUN STAYCATION IN LAGOS"
WE ARE GOING OUT ON A LIMB ON THE 8TH OF APRIL! SISI WEEKLY EP #84 "THE OTHER SIDE OF LAGOS"
SISI WEEKLY #83 "NEW HOUSE TOUR!"